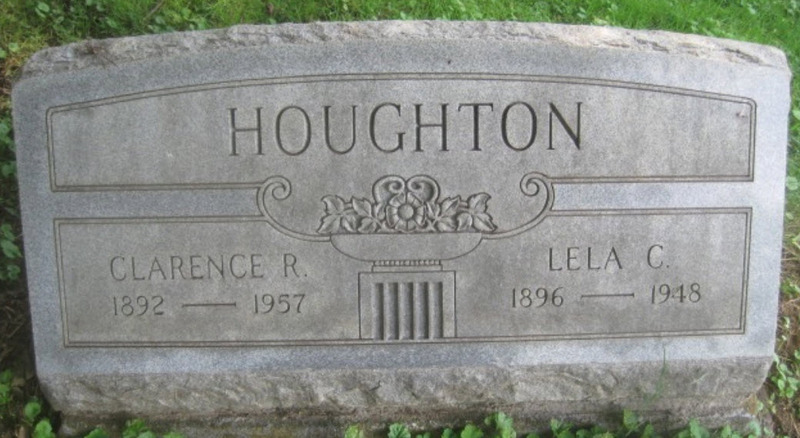 Clarence Richard Houghton married Lelia Catherine Grim in circa 1922 age 26 and 24. Clarence Richard Houghton married Catherine Clement Chrismore in 1951 second marriage for both. Lelia Catherine Grim married Clarence Richard Houghton, son of John Richard Benjamin Houghton and Mary Ellen Gaunt, in circa 1922 age 26 and 24. Mildred E. (?) married Eli Arthur Houghton, son of William Houghton and Sarah Jackson, in circa 1881 mar 13/19 years in 1900 census. J. P. Houghton married Evaline (?) in circa 1880 mar 20 years in 1900 census. Evaline (?) married J. P. Houghton in circa 1880 mar 20 years in 1900 census. Frank Houghton married Nellie (?) in circa 1899 age 37 in 1900 census. Nellie (?) married Frank Houghton in circa 1899 age 37 in 1900 census. William Joseph Houghton married Rosella J. Lydick in circa 1892 mar 8 years in 1900 census. Rosella J. Lydick married William Joseph Houghton, son of Richard Houghton and Margaret Harrison, in circa 1892 mar 8 years in 1900 census. Maggie M. Englehart married Henderson W. Houghton, son of James Richardson Houghton and Cerelda Jane Hunsaker, in circa 1896 mar 4 years in 1900 census. Maggie M. Englehart married Charles A. Hamilton in circa 1910 mar 0 y in 1910 census. James Houghton married Jane J. (?) in circa 1879 mar 21 years in 1900 census. Jane J. (?) married James Houghton in circa 1879 mar 21 years in 1900 census.